In this worksheet, students spot quarter and half turns, clockwise and anticlockwise. 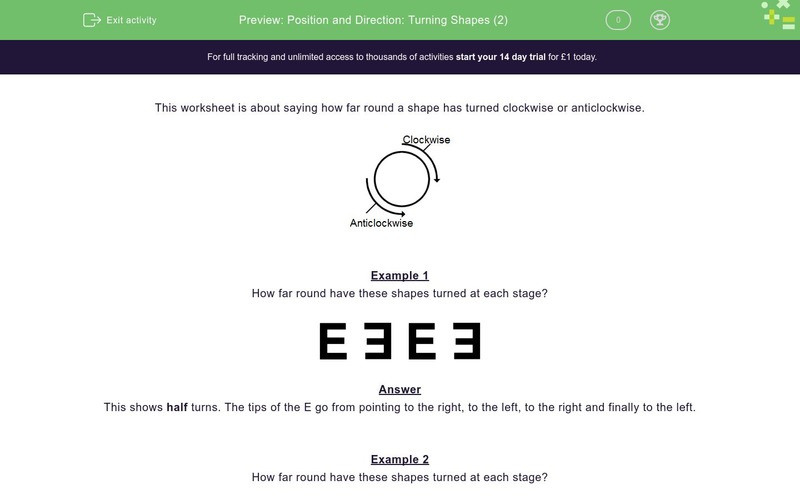 This worksheet is about saying how far round a shape has turned clockwise or anticlockwise. How far round have these shapes turned at each stage? This shows half turns. The tips of the E go from pointing to the right, to the left, to the right and finally to the left. This shows quarter clockwise turns. Look at the tip of the arrow. Imagine a clock face. The tip goes from 12 to 3 to 6 to 9. 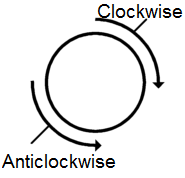 At each stage it is moving clockwise a quarter turn. Look at the black part, which is moving a quarter turn clockwise at each stage. Look at the tip of the arrow, which is moving a quarter turn anticlockwise at each stage. Look at the top of the A, which is moving up and down at each stage, i.e. half turns. Look at the tip of the arrow, which is moving a quarter turn clockwise at each stage. Look at the tips of the E, which are moving right to left, i.e. half turns. Look at the black part, which is moving a quarter turn anticlockwise at each stage. Look at the tips of the arrows, which are up then down etc., i.e. half turns. Look at the black parts, which are up then down etc., i.e. half turns. These are also half turns, because the black parts go right, left, right, left. Again half turns because the tips of the arrow go left, right, left, right.